The drive back from Valdez wasn’t too tricky at first. Maybe it just seemed easier because the weather was good and I basically had the road all to myself, but during the trip back to Glennallen and for about the first hour or so west of there I was feeling pretty confident about my ability to get us back to Anchorage before dark and in one piece. I wanted to grant his request. I swear I did. But there was no way I was going to be able to drive that car down that hill at that speed in the rain and live to tell the tale. From the way my blood was pumping, even if we didn’t careen off the side of the mountain and die in a fiery crash on the banks of the Matanuska River, I was still going die—of heart failure, a stroke or aortic aneurysm. So I tried to conjure a third option and, to my relief, spotted one almost right away. It was a sign that said there was a runaway truck ramp just a short distance up the road. And it was on a straightaway, so if I decelerated too quickly for the semi’s comfort, at least he could move over to the other lane long enough to get around me. As I signaled my intent to exit the road—my hands, arms, and neck tingling from how tightly I was gripping the wheel and my legs trembling from trying to resist the urge to slam on the brakes—the Jarhead urgently asked what I was doing. Unsure whether he had missed the sign or had seen it but didn’t want me to take it, I ignored his question, applied the brakes, and all but slid sideways off the road and onto the gravel platform. It was all I could do not to start bawling like a baby the second the car came to a halt. As it was I shook for several minutes as I tried not to cry. Having felt the semi whiz past us at a terrifying rate of speed, I knew I’d made the right call even if the Jarhead disapproved. Our chances of survival were better with a sleepy person in control of the vehicle, I told him as we unbuckled to swap seats, than with this chicken sh*t behind the wheel. I almost rescinded that remark an hour or so later when we came literally face to face with a moose cow and her calf as we made our descent out of the mountains. The Jarhead was gawking at something to his left at the time, and just happened to glance to the right in time to see my panicked face bracing for impact. Thinking I was overreacting again—a fair assumption, I’ll admit—he casually returned his gaze to the front with just enough time to hit the brakes and come grinding to a halt a few feet in front of them. “Why didn’t you say something?” he asked as we watched them meander off the road and into the woods. Oh sure. As if that would have worked. Anyway, we didn’t hit the moose—or anything else, for that matter—and thanks to his grace under pressure, we made it back to Anchorage. It was later than we’d planned, but at least we had arrived alive. Perhaps that’s setting the bar too low, but it works for us. And I’m okay with that. The road between the Denali turnoff and Fairbanks is remarkable in that it is entirely unremarkable from a topographical perspective. With its winding rivers, grassy marshlands, random forests, and scrubby brush land, the area looks pretty much like northern Minnesota or Wisconsin. In fact, were it not for all the fireweed and the unfamiliar town names and road numbers gracing the signs along the way, the route we took to Fairbanks could have passed for any number of highways connecting the northern part of any Midwestern state to its nether regions. Still, it was uncharted territory for the two of us, and we were thrilled to have the chance to see it up close—even if it looked a lot like home. Although the topography was relatively familiar to our eyes, other aspects of the geography were not. In fact, now and then it would feel as though we’d entered a land that time forgot—like when we would run across a house featuring four different types of siding or a tri-color roof that looked more like a shed or a kid’s fort than a dwelling. In any other setting, such a sight might suggest poverty or malfeasance. But out here, where resources are scarce, a house of many hues is not so much a reflection of one’s income or iniquity as evidence of one’s ability to improvise, overcome and adapt. Many in the so-called civilized world like to talk about the environment and conservation, but the folks who live in the sticks of Alaska take the concept of reduce, reuse, and recycle to a whole new level. Whether they do so by choice or by necessity, one has to admire their ingenuity. Contrary to what some might believe, I did not spend the bulk of the drive waxing poetic about the virtues and vitality of the inhabitants of Alaska’s interior. If I had, no doubt the Jarhead would have set aside his distaste for talking to strangers and stopped off somewhere to borrow a strip or two of duct tape. But since he was napping (ostensibly) most of the way and thus would not have heard me anyway (or would have pretended not to) I kept such thoughts to myself. There were times, of course—especially when we would go miles and miles without seeing another car—that I wondered if we were making a huge mistake in venturing out on our own without an atlas or a firearm. But whenever such a thought would occur to me I would remind myself that the people who live in the interior do so for a reason, and therefore are less interested in us than my ego would have you believe. Not to mention the fact that the folks who are up to no good are likely to be packing more firepower than whatever we could have brought along for protection. And so instead of contemplating who might be looking to murder me (and when, where, and how) I considered what I had learned about Alaska so far on this trip that was unlikely to be found in your average textbook or on even the most thorough of travel websites. One thing that came to mind was the subtle rivalry that apparently exists between Alaska and Texas, as evidenced by all the items bearing the phrase “Let’s cut Alaska in half and make Texas the THIRD largest state” or some variation thereof. With both states being famous for their size and their oil, I suppose it’s only natural that they would compete with one another, but I found it odd that two places that are so different—and so far apart—would even bother. Being more accustomed to regional rivalries, such as exist between Minnesota and Wisconsin, I would have expected to see merchandise with trash talk directed at Canada, perhaps, or at least the Yukon. Consequently, a rivalry between Alaska and Texas made about as much sense to me as would a rivalry between beef jerky and Laffy Taffy. A more fitting rivalry for Alaska, in my view anyway, would be Minnesota. Both states are known for their harsh winters and hardy residents, after all, and until Alaska came along and stole its thunder, Minnesota was home to both the northernmost point in the United States and—according to my friends at Wikipedia—more square acres of wetlands than any state in the nation. In addition, both are populated by hunting, fishing, hockey, and snow machining enthusiasts, and both attract their share of tourists. And still, despite all these ingredients of a rousing rhetorical grudge match, I have yet to see even a one tee shirt or coffee mug in either state speaking mockingly of the other. Then again, having been to the Lone Star State three times without seeing any evidence of an adversarial relationship between it and the Land of the Midnight Sun, I’m inclined to think Alaska’s war with Texas might be a one-sided argument. Either that, or Texas handles its enemies the way I do mine: by pretending they don’t exist. Near the end of the day’s drive, I learned something else about Alaska: The suburbs there look pretty much the same as the suburbs in every other state. In fact, if I hadn’t been awake for the entire drive—if instead I’d been chloroformed, thrown in the trunk, driven around for several hours and somehow managed to escape the vehicle while my captors stopped for coffee or to use the restroom—you could have told me we were in Burnsville, Green Bay, Fredericksburg, or even Philadelphia and I totally would have bought it. At least until I noticed the road signs. And maybe a license plate or two. But up to that point, surrounded by buildings bearing the names of nearly every single restaurant, clothing store, and home improvement center to be found orbiting every city in the lower forty-eight, you would have had a hard time convincing me we were in Alaska. As they saying goes, “When in Rome, do as the Romans do.” With that in mind, we pulled into the parking lot of the Hilton Garden Inn, tossed our bags into a room that looked exactly like every other room in every other Hilton Garden Inn in every other city and, after a brief stop at Walgreens, set out to find a place to eat whose sign did not end in bee’s, back, or bucks. This was a bigger challenge than one might guess since, those that weren’t part of a chain often looked a bit like the houses I mentioned a few paragraphs ago. Eventually, though, we found a place called Brewster’s where we enjoyed “Great Food, Great Alaskan Spirits” just as their slogan promised. Specifically, we enjoyed their simply-named, signature appetizer, Steak Bits, which are tiny chunks of steak simmered in a sort of savory broth and served with garlic toast. And when I say enjoyed, I mean it. It was the most delicious and different treat we’d sampled in a long time. And the rest of the meal was no slouch either. To top it all off, our server apparently recognized the Jarhead’s military bearing and, without prompting, offered us a military discount. It was all almost too good to be true. And yet, it was. The next morning we set off for the Arctic Circle, which, according to LaVon’s map, was just a few miles off the highway between Fairbanks and North Pole. Although we didn’t expect to be greeted with the kind of fanfare one might receive upon completing a marathon or winning a Grammy, we were at least hoping to take a photo and earn some bragging rights. Two hours and countless miles later, however, the road terminated at a resort at Chena Hot Springs. Having seen nothing in the way of a sign or symbol referencing the Arctic Circle along the way, we were more than a little bit confused. Had we misread the map or simply missed a turn? Had LaVon’s memory failed her when she was drawing the map that morning? Or could the phrase “a few miles” means something different to one former Minnesotan than it did to others? Sadly, there had been no one to ask about the location of the Arctic Circle as we made our way to Chena Hot Springs, and once we got to the point where the road terminated it seemed a moot point. So, after giving Oscar-worthy portrayals of a couple of paying customers while strolling around the resort in search of a restroom, we turned the rental around and headed back to toward the highway. We never did find the Arctic Circle, but we did make it back to Fairbanks and on to Glennallen via North Pole and Delta Junction. Along the way, we stopped off at several state parks and scenic overlooks to admire all the rivers and other natural wonders to be found along the way—including two moose, one moose calf, scores of bison and one semi-suicidal elk. At one stop we found and photographed no less than a dozen types of mushrooms—more than I had ever seen in one place other than a field guide. Despite our futile attempt to find the Arctic Circle, it was a great day. By the time we landed in our room—having stopped at the first place we found with a vacancy—we were more than ready for bed. Which is good because we had few other options. Having arrived at 8:51 to a restaurant whose staff had decided to close at 8:45 instead of 9, we were unable to procure a hot meal, and thus had been forced to choose between something from the cooler and whatever could be found at the convenience store we’d passed two miles back on our way into town. In addition, as none of the outlets in our room were tight enough to maintain a circuit or hold a plug, we were unable to use any electronic device other than the television that was mounted in the corner of the room near the ceiling and whose cords had been carefully run through the wall with the goal, one assumes, of thwarting a theft. Consequently, the Jarhead was forced to position the nightstand in such a way that would hold the plug in the outlet so I could run my CPAP and not die from lack of oxygen. Likewise, he was able to arrange a chair, the refrigerator, and microwave—MacGyver style—so we could charge our phones and run the box fan that provided the white noise I needed in order to sleep in a remote area with funky electrical systems and employees who resented their patrons. On the upside, there was a Jacuzzi tub in the room from which one could see the television and imagine it falling from its perch and landing somewhere in the vicinity of one’s knees. Even after the Jarhead pointed out that for the TV to fall into the tub it would also have to break loose from its power source I was completely disinclined to give it a try. Given my lack of faith in the facility’s wiring and my general aversion to death by electrocution, it just made more sense to avoid using water altogether. Instead, we hit the rack and watched reruns of Forensic Files and Unsolved Mysteries until the Jarhead had nodded off and I was left to imagine all the possible crimes to which I could fall victim before daybreak. Naturally, I would have preferred to imagine myself awakening to a bright sunshine and travelling joyfully to Valdez, but we all know that isn’t how this mind works. Nevertheless, at some point I decided I’d rather be killed in my sleep than face whomever might come through the window or door, and switched off the tube and waited like Will Smith in “I am Legend” for morning. Of all the ways a body can spend a Saturday, shopping would rank among my least favorite. Of all the ways a body can spend ANY day of the week, in fact, shopping would rank among my least favorite. To belabor the point, if I were to create a list of the ways I would deliberately and knowingly pass a few free hours, shopping would come in second from the bottom followed only by having handfuls of my hair ripped forcibly from my head. That assumes, of course, that one has already excluded NASCAR events, golfing, and reality TV from the list, and that neither Donald Trump nor Sarah Palin is speaking into a microphone somewhere. And yet, there we were—David, LaVon, and I—on the morning of August 15th, strolling from booth to booth, and later store to store, through the fog and drizzle in downtown Anchorage. We could have been on a boat watching dolphins and whales. Or on a ferry to Kodiak Island to watch grizzlies feasting on salmon. Or on a train bound for Whitter followed by a 26 glacier cruise. But no. Clad in jeans and rain gear, and sporting hair that looked like something out of a Dr. Seuss book, I was taking one for the team. Primarily because the Jarhead loves markets and the market is only open on Saturdays, but also because it’s hard to see glaciers—much less whales and wildlife—through the fog and rain. And because, in that weather, my hair would have been a nightmare anyway. So, despite the cold wet weather—which the Jarhead hates, though evidently not as much as he hates NOT shopping—we went shopping. Or, more accurately, we went window shopping. Because, although the Jarhead enjoys shopping, he enjoys the IDEA of shopping more, since it’s generally less expensive, and you never regret THINKING about spending your hard earned cash on home grown produce, Inuit folk art, or a new leather jacket. Well, almost never. One notable exception occurred during our first trip to Anchorage and the Saturday market in 2005. It was June and one of the first booths we approached was offering fresh morels. The Jarhead is very fond of the elusive fungi, so he was tickled at the prospect of taking some home. Not wanting to carry them around all day, however—especially if they could be purchased for a lower price at another booth—he decided to skip buying them on our first go around and to pick up a pound or two on our way back to the car. Apparently he misjudged just how popular they would be among his fellow marketgoers, however, because by the time we finished our meander through the market there were no more morels to be found. No such sorrow would befall us this time around, however. Ever the type to learn from his mistakes, the Jarhead vowed not to miss his next opportunity to take home the tasty treat. Fortunately there was no one selling morels in mid-August, or who knows how many duffle bags we would have had to borrow from LaVon in order to carry the precious cargo back to Wisconsin! As it was, we had to borrow at least one bag to carry all the souvenirs we had purchased while we were there. Among these was a cribbage board that we bought as a gift for El Noble and unwittingly swiped right out from under the nose of a fellow Wisconsinite. Fashioned from an elk antler, the board measured over twenty-four inches long, and was perfect in terms of shape, color, and condition. We knew it would make a great conversation piece as well as a wonderful addition to El Noble’s man cave—provided we could get it home without crushing it or snapping off one of the spikes. Little did we know—until we had already paid for it that is—that another customer had seen the item earlier, and had decided to come back to purchase it. And so we were a bit uncomfortable when, as the clerk was bagging it, a man approached the counter and asked about the item, which had been on display on the far table, only to learn it had just been purchased by the guy standing next to him. Visibly irked, he man turned to the Jarhead and offered to buy it from him. When the Jarhead declined, the man then looked him up and down and asked him where he was from. And people wonder why I’m so skittish. Anyway, the rest of the day went about as smoothly as it could have given the weather. The Jarhead was glad he hadn’t hesitated on the cribbage board the way he’d hesitated on the morels ten years ago, and I was glad he hadn’t mentioned our last name or our street address to anyone who might want to find us. A couple hours later, after trudging up and down the streets of Anchorage looking at various fur and leather items whose beauty and prices took my breath away, we enjoyed a meal at a popular local watering hole and then headed back to the house to freshen up. That evening we dined with a couple of LaVon’s friends, and then hit the sack to rest and recover in preparation for our very first adventure into Alaska’s interior! 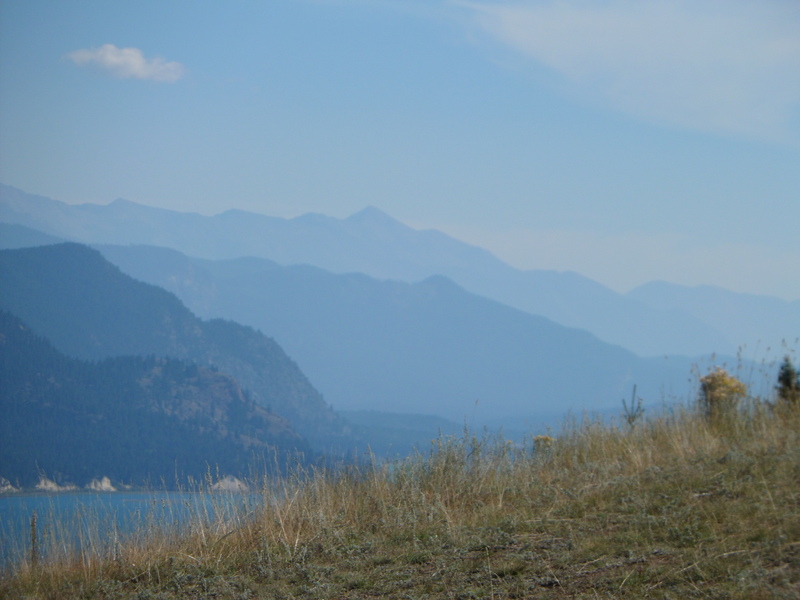 According to our itinerary, we were to spend Saturday driving through the mountains of western Montana, and stop for the night somewhere in the vicinity of Helena. This would have been a simple goal to accomplish were it not for my irrational fear that we would go careening off the edge of the road and fall to our death if we drove faster than 40 miles per hour. Presented with the choice between driving for 6 hours at 40 miles per hour with a calm companion and driving for 4 hours at 60 miles per hour with an anxious one, the Jarhead did what any sane and loving man in his situation would have done and decided to ignore me. Now before you condemn him for his cold heartedness, it’s important to consider the alternatives. For example, he could have stopped to let me use the restroom and taken off again without me. Alternatively, he could have wrapped me in a blanket, stuffed a sock in my mouth, and forced me to experience western Montana from the bed of the pickup. For that matter, he could have wrapped me in a blanket, stuffed a sock in my mouth, and forced me to experience western Montana near a tree in the ditch. I could go on, but for a change I’ll just leave you to imagine the possibilities. With so many other options at his disposal, I’m beyond grateful that he chose the one he did. Even if it required me to shotgun the last two tiny bottles of vodka in the center console and spend 4 hours with my hands over my eyes or gripping my seat in terror, in the grand scheme of things, I think I came out ahead. And I did manage to see some spectacular views and lovely animals while peeking between my fingers and praying to multiple deities to forgive my sins—especially swearing—and spare my life. As you know, I like to share my views…so here’s another one. 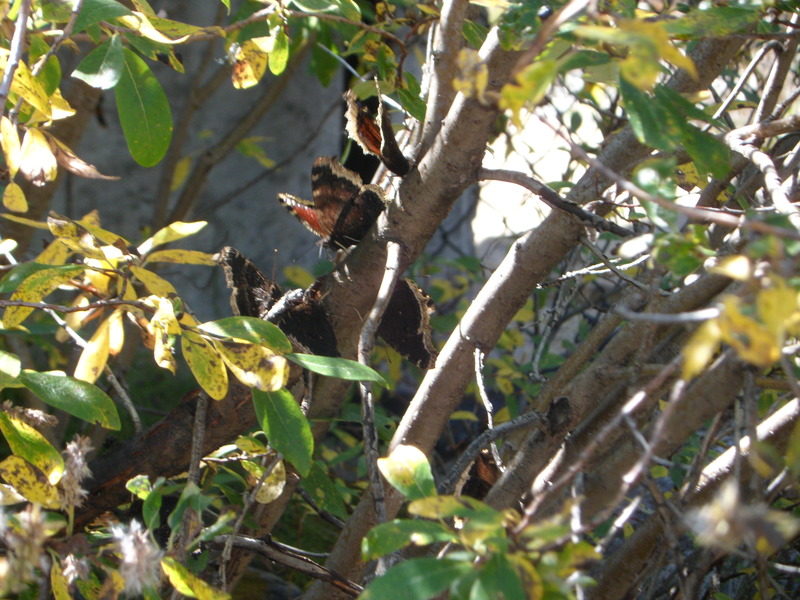 These butterflies, like my advice, are free. 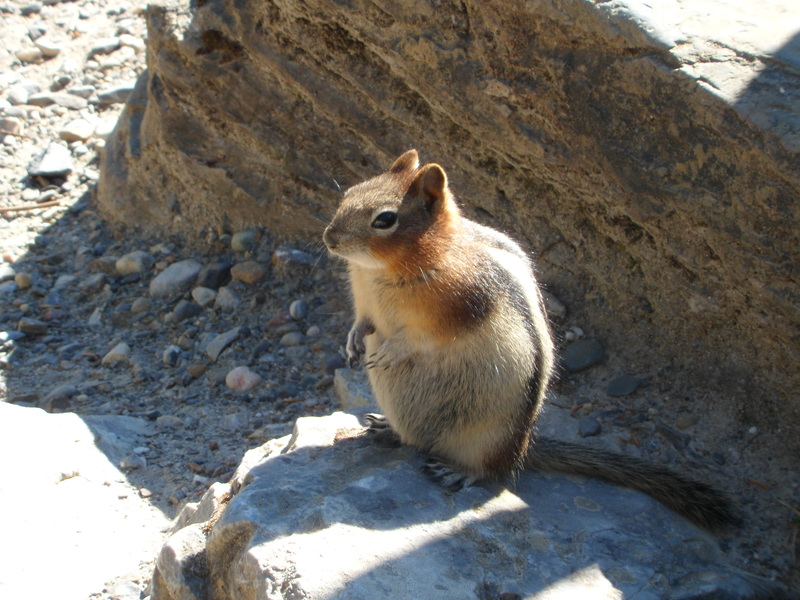 Do these rocks make this chipmunk look fat? It’s not the photo. 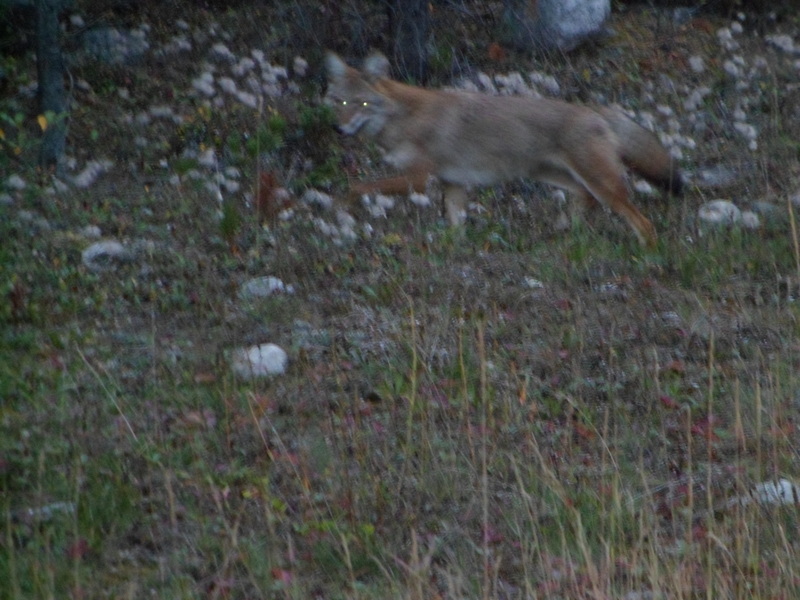 Like Bigfoot, this coyote IS blurry. 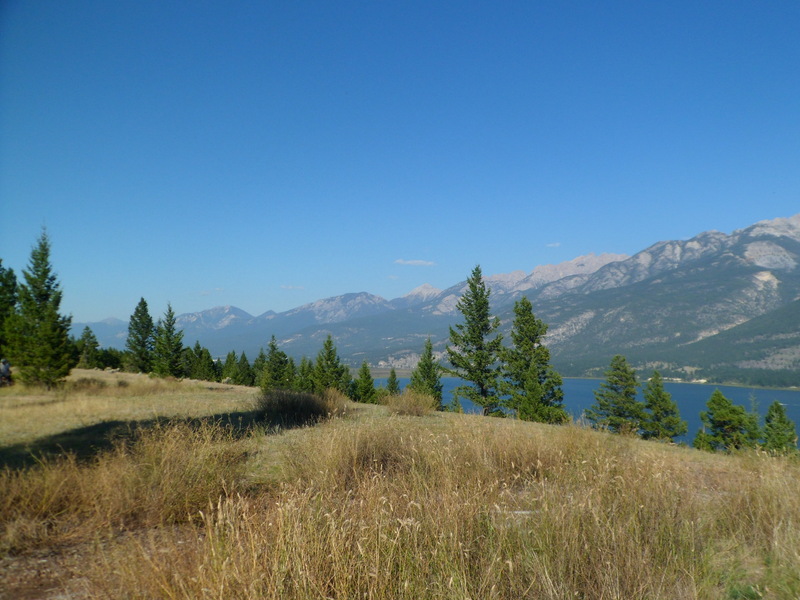 The trip took us down highway 2, which runs along the Kootenay River a good ways before turning south near the town of Libby. From there we continued through Kalispell and Missoula, and on to Helena, where we stopped for the night. It was during this leg of the trip that we made an important discovery: Forget Vegas. If you like to gamble, Montana is the place. There were literally casinos everywhere. Hungry? Try K.C.’s Food, Drink & Keno. Gotta gas up? Check out Jim’s Pump ‘n Poker. Outta milk? Visit Sam’s Grocery Mart and Slot Shop. I didn’t see this one myself, but if we’d had more time to kill, no doubt we would have found Auntie Annie’s Day Care and Texas Hold ‘Em. Worn out from the long drive and our late bedtime the night before, we decided to forego all of these attractions. Instead, we had a quick dinner and went to bed early so we could hit the road refreshed the next day for our drive to Rapid City.